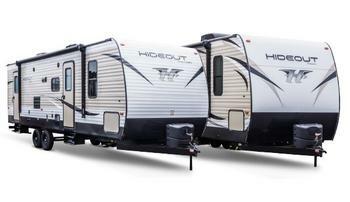 Keystone RV Company is recalling 12 model year 2018 Hideout recreational trailers, model 310. The vehicle's federal placard incorrectly lists the Gross Axle Weight Rating (GAWR) as 5,080 lbs and the tire size as ST225/75R15D with 65 PSI. The correct GAWR is 5,200 lbs and the correct tire size is ST225/75R15E with 80 PSI. These vehicles, thus, fail to comply with the requirements of 49 CFR Part 567, "Certification." Incorrect label information may cause the operator to underinflate the tires, possibly resulting in their failure and an increased risk of a crash. Keystone has notified owners and provided a corrected federal placard, free of charge. The recall began on December 27, 2017. Owners may contact Keystone customer service at 1-866-425-4369. Keystone's number for this recall is 17-310.